I am loving the hobby at the moment. Although I’ve barely managed to pick up a paintbrush recently, I have managed to get in a higher than normal number of games. 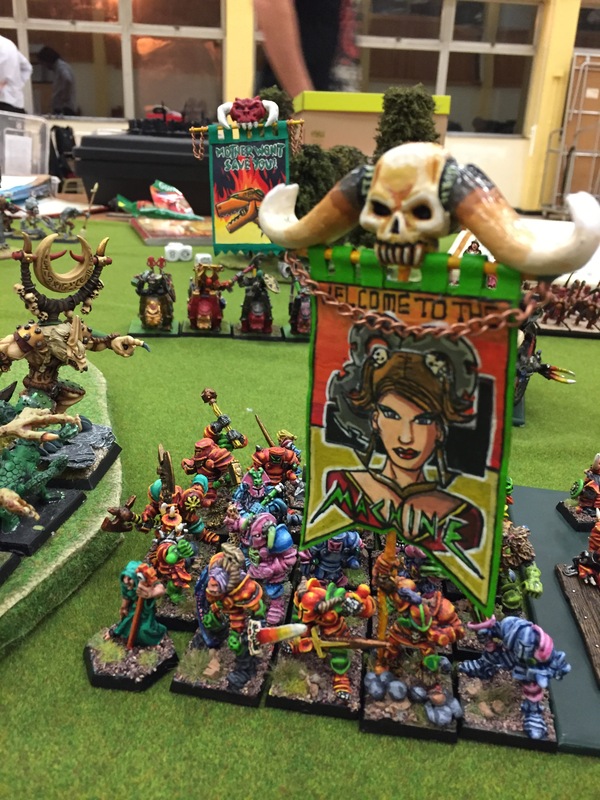 It’s helped that I’ve discovered an active community of fellow 8th edition lovers at: http://eefl.freeforums.net/ and so the gaming side has jumped up the list of priorities (or to be exact, the gulf between that and painting has grown further). On the weekly Friday club night, I’ve arranged to have a rematch vs Luke’s WoC. 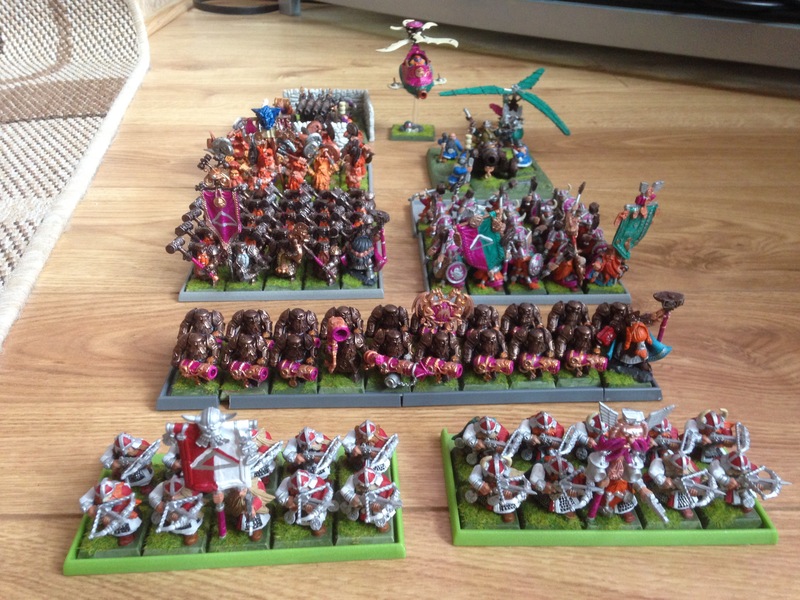 This game has a multi-faceted purpose: We will be trying out the terrain table that I adapted from Neil’s KOW comp pack: We will also try out one of the new scenarios I’ve put together from various sources and as I promised him, this time I’ll bring my take on the classic Dwarf gunline. This list is very close the the previous one taken in my game against Neil. As such I’ve covered most of the reasons for the choices in my previous post (here). So i’ll just cover the changes to the list and the reason for making them. There were 2 changes to characters. The first was to change the load out of the Runesmith that goes in the Irondrakes. He was given a 1+ save and a great weapon to give the unit a bit more punch (and I liked the idea of taking a more combat orientated character). He still retains the rune of spellbreaking. The second change was dropping one of the Master Engineers. The reason for this was because I decided to swop out one of the two Organ Guns and replace it with a Grudge Thrower. He wasn’t needed as adding Runes to the machine worked out cheaper. I took the grudge thrower for a couple of reasons. I hadn’t used a stone thrower in this edition and after the last battle, I realised I needed another long range threat in case one of them is taken out early on. The grudge thrower with Rune of Penetrating, gives another S10 long range attack and also gives a template attack that causes S4 hits on everything else under the template. It also has the advantage of being able to fire indirectly (so could hit Ironblasters/skullcannons hiding behind buildings). The only other changes were to the Irondrakes. Having failed (yet again) to hit anything all game with it, I removed the Trollhammer Torpedo and replaced it with my preferred Brace of Drake Pistols. The points saving, together with the saving from removing the Master Engineer, also allowed me to bump up the numbers of the unit. Luke created this list, adhering to my first draft of the Army Building restrictions for the 2017 competition. I had warned him it would very likely change but I suspect it made him think about taking something different in his list. He has ensured he has more standards in the list as many of the objectives require units of 5+ with standard to win. He is also trying out a chimera for the first time, a unit I think he will very much like. Thrud has been moved from a disc to a daemonic mount. Yes he loses some manoeuverability but he gains a wound and a point of toughness. I think this is a good move as in both our previous games (with me using Beastmen and Dwarves respectively), I’ve killed him off in combat despite the 3+, 3++ saves he was sporting. The DP has also reverted back to the Lore of Death and with its upgrades, I really don’t want it getting into combat. I will say that my main aim of the game will be to test out and try and ensure the new scenarios work as expected. Of course I will be trying to win but that is not the primary aim.